It’s been a magical year for former Cardinals defensive lineman Calais Campbell, who went for the big money in Jacksonville as a free agent all the while insisting the Jaguars could win this year — and he was right. It’s been in no small part because of Campbell, who had a career-high 14.5 sacks and was named Wednesday as the Pro Football Writers of America’s choice as NFL defensive player of the year. 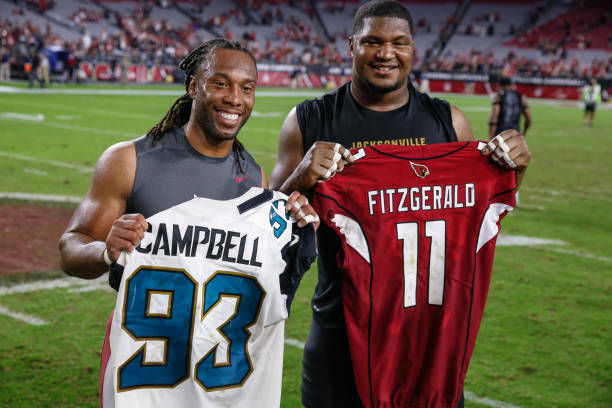 Obviously, Campbell’s career was built in Arizona, regardless of what happens in Jacksonville. That subject came up during Campbell’s press conference this week prior to the AFC championship game, as Campbell was asked about his huge year as a 31-year-old. Campbell said he simply has worked hard to make sure he has stayed in shape and preserved his body — something he had to learn in his early years as a Cardinal.